Green peas are a good source of dietary fiber and are the powerhouses of nutrition. Consumption of this superfood is very healthy. Peas contain a high amount of coumestrol which helps in the prevention of stomach cancer. More than that peas have high levels of antioxidants which help in anti aging, high energy, and strong immune system. 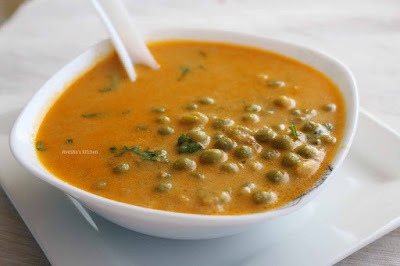 Today am here with an easy and quick Indian style peas curry recipe. Green peas cooked in coconut milk and spices gives a special flavor. You can also use coconut milk instead. In a pressure cooker, add oil. Splutter mustard seeds, curry leaves and then add sliced onion. Saute until it turns to light. Grind together tomato, garlic, ginger and fennel seeds to a smooth paste. Add this tomato mixture to this sauteed onion. Combine well and cook for few minutes. To this add chili powder, turmeric powder, coriander powder, and hing. Mix well. 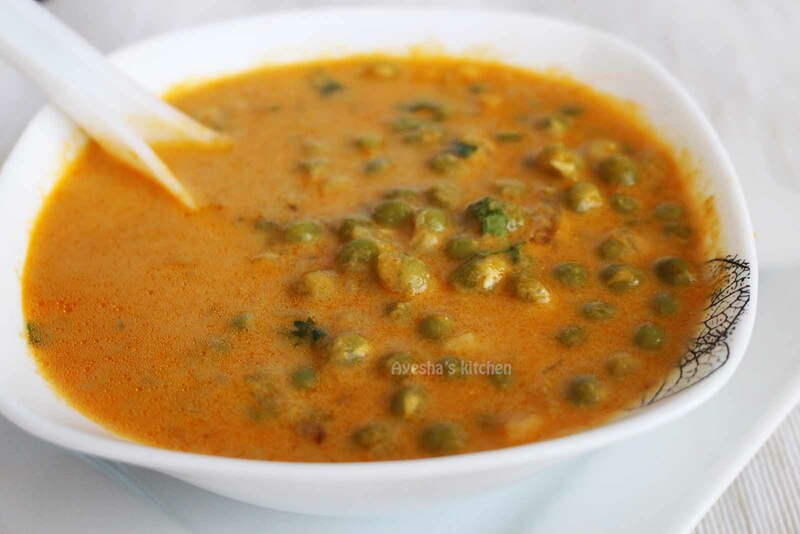 Then add the soaked green peas (soak green peas in water for at least 4 hours or overnight). Combine well and add required salt also. Add half a cup of water and pressure cook it for 3 whistles. Once done and when pressure releases, add half a cup of milk and again boil it for a couple of minutes. Now the gravy becomes thick in consistency. Check for salt and remove from flame. You can add hot water if you need thin consistency. Serve hot along with dosa, chapati etc.